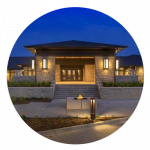 Forest Lawn Funeral Home, Cemetery and Crematory began serving Omaha and the surrounding area in 1885 and is committed to keeping its long history of care going. Forest Lawn wanted more contacts of people interested in preplanning, but they had trouble finding individuals or families prepared to make their final arrangements. The decline of print advertising and its effectiveness meant traditional methods didn’t work as well when making the firm’s preplanning offerings known to their community. Plus, they found their community needed to better understand the importance of preplanning and how it benefits a grieving family. They turned to the team at Funeral Innovations to help them gather names and emails of people specifically interested in making final arrangements so their staff could directly contact those interested. 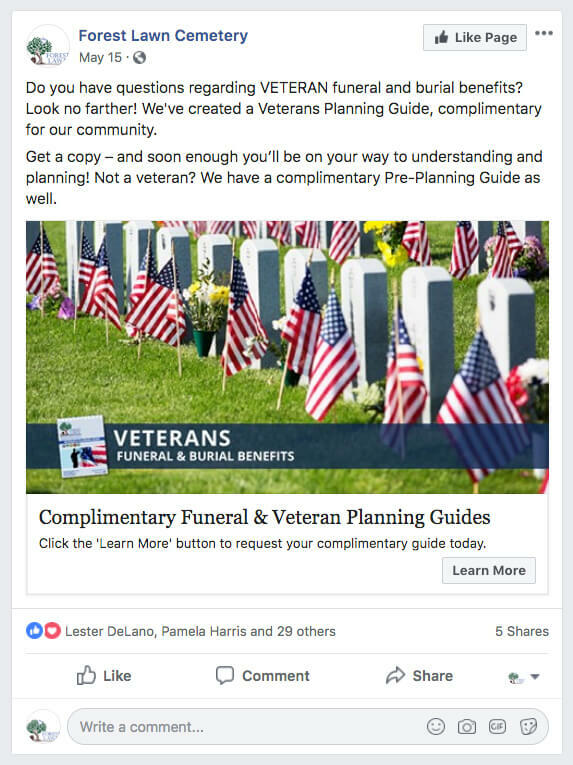 We developed a custom Growth Engine Campaign to run on Facebook and intended to reach Forest Lawn’s community, educate them on the importance of preplanning for a funeral, and explain the benefits preplanning offers to surviving loved ones. The Growth Engine Campaign offered people a professionally designed, complimentary planning guide for those interested in planning final arrangements in exchange for their contact information, including a name, email, address and phone number. Using data from our long history in the industry, we created a Facebook audience targeting men and women between the ages of 50-65. We knew this audience would reach the people most likely to choose to preplan based on other campaigns we’ve run. The Growth Engine Campaign ran for 30 days on Facebook and consisted of five separate ads. Some ads targeted veterans specifically, while others focused on the community in general. Forest Lawn received 102 contact names, emails and phone numbers for their staff counselors to connect with. Each contact also received a follow up email from our Growth Engine alerting them a preplanning counselor would be reaching out to them to arrange the delivery of their free, preplanning guide in a hard copy. Want to learn if your market would see similar success? Let’s talk! Fill out the form below.